This report highlighted the various issues relating to the conflict that usually arise in the industrial sector. 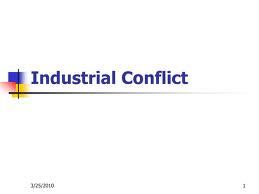 Industrial conflict is a very severe matter as it affects the usual performance of the employees. It also deteriorated the relationship between management and employee which ultimately affect the organization productivity, employee morale, dissatisfaction etc. If employees are in conflict with management they will work seriously at the same time they will not think themselves as a citizen if the organization, which demodulate them to work with enthusiasm and spirit to do the best and to bring the best outcome for the organization. Industrial conflict impede the achievement of organizational objectives. A gap exist between the owner and the employee which instigate them to ignore organizational interest even they can go for vandalism without any hesitation as they think it as a weapon of getting their policies and claims implemented. • be able to apply explanations for industrial conflict to contemporary situations. If the stakeholders of the industrial sectors (like- labor. Management etc) are affected economic penury then the interrelationship between or among the parties may deteriorate. For example- if the employees cannot fulfill their basic needs with the economic condition they posses, then they can try to ptrotest3 for fulfilling their economic and basic demand that ultimately creates industrial conflict because sometimes government can fail to intervene or the management may deny accepting the claims of the employees that integrate industrial conflict. Conflict brings new impression in the mind of employees and management and brings about a change in the organizations environment. This leads to a new arrival as things come in the concern of the organization. Conflict helps to find out existing problems of the organization and help the organization to add some new changes that can be conducive for the improvement of activities of the organization and its resources including the Human Resources. Any conflict within the organization require the organization to take prompt initiative for solving the conflict because any late in decision making can have a negative impact on organizational activities or any loss that may incur for the existence of the conflict. When any conflict arises, it needs a clear explanation to know the reasons of conflict, environment of the conflict and these details details help organization to identify the lacking or weakness of the association and give an chance to the organization to improve its internal decoration or policy with necessary changes. When any conflict, arise suggestion, judgment, recommendation or decision is needed to take from different units of the organization, which allow or help the employees to investigate their creativity because any result needed is not easy to find out. Therefore, any suggestion if asked from the employees, helps the business to know the creativity level of the employees. Conflict creates lack in the mind of employees as they remain in fear that they may be defeated to others in terms of authority or power. This feeling may influence the level of recital of employees, reduce morale, and increase dissatisfaction that ultimately affect the productivity of the business. Conflict creates reserve between or among employees that deteriorates the relationship among them and create a chaotic situation within group or within business. Conflict induces lack of confidence among the employees that can reduce their confidence and dissatisfaction may uplift. Conflict increases labor turnover of the organization as the employees may have the business either to avoid disagreement or to retain authority and status. That’s why the more will be the labor turnover as the employees will not be able to adjust themselves with such a conflicting condition. Conflict gives raises the problem-making attitude on employees and they try to do the same tasks repeatedly to hold power or to fulfill their own interests, such negative approach leads to a long-term bad significance of conflict and business faces lease less difficulty relating to conflict and the cost of conflict declaration reach to the peak. Conflict may motivate change in intention of the workers. It creates maunder standing in the mind of workers and interrupt the common flow of performance. One of the ways administration can face conflict is by avoiding conflict. That means administration is not interested to deal with conflict or if any conflict arises a negligible importance is given to handle such conflict and no unique step is taken to decide such a conflict. Another way conflict can be managed is by creating smooth situation in the organization that look after arrival of conflict and minimizes the possibility of such a conflict to happen. Organization can do it by providing essential facilities within the organization that reduces the dissatisfaction level of employees, which ultimately reduces the possibility of conflict appearance. Management can relate force to resolve conflict. It means management can take some harmful approaches that can discourage employee to go for creating conflict. For example- termination, salary cut, lay off etc can be supportive to reduce the level of conflict in the business. Management can Compromise through negotiation or harmony with the employee or employee representative i.e. trade Union because agreement between management and employee can remain the conflict level as smallest as feasible. Management can manage conflict by changing activities of employees. This can be done by providing training to the employees on conflict and conflict resolution technique because if employees can be trained well and they can be convinced about the harmful consequences of conflict that may have an efficient influence on the behavior of employees at the time it will be beneficial for the organization to continue free of conflict in the long run. Management can reduce the conflict by taking initiative of problem solving. That means management can avoid conflict by solving the problems instantly just after its entrance because any delay in difficulty solving can create serious ambiguity or misunderstanding among employees that’s why difficulty should be solved as early as possible. Management can take away those structures that create conflict or leads to conflict. Organization can diminish the organizational organization to reduce contact gap and ambiguity. So the structure of the organization should be changed or redesigned in such a way that minimizes the possibility of conflict. All essential support, facilities in terms of resources, equipment should be provided to the employees so that lodging is smooth sufficient and reduce conflict. The exercise of competition has to be introduced within the business so that employees always try to improve their own quality to proof supremacy and to get promotion. That’s why diverse programs can be initiated that can increase competition. The less will be level of conflict within the association. First task of the facilitator is to building anticipation. The roles that work against the interest of employees or that create conflict should be reversed to make the procedure easier and to resolve the conflict smoothly and in a friendly atmosphere. Facilitators another task is to relieve tension to create a conducive atmosphere in the resolution procedure. Facilitator has to transmit information to the concerned parties to get their response and to inform them about the matter in details. This will help the facilitator to resolve the conflict in an effective manner and in way that is more constructive. First proposal will include the basic objectives of the facilitator and the procedure to be followed to resolve conflict. At the same time functions of facilitator is also determined in the proposals that will be carried out in resolving the conflict. In which legal sense the problem will be treated and solved will have to be incorporated in the proposal. What will be the steps that will be followed to resolve the conflict is to be mentioned in the proposal to give a clear idea about the resolving procedure. The parties to be participated in the resolving procedure is also determined and prescribed in the proposal in a comprehensive manner. The groups involved in conflict will have to be given enough independence so that they can express their feelings and statements without any fear because any fear can interrupt on the way to the proper disclosure of information that may be helpful in resolving the conflict. Facilitator has to keep himself in a far distance from evaluating the concerned people. Facilitator finds the method that removes the disintegration so that no business works in resolving procedure. The proposal should be designed in such a way that it can be understandable to everybody involved and concerned in conflict. No vogue word, symbol or statement should be used to avoid ambiguity in meaning regarding the conflict handing techniques and procedures. Observe the solutions when it is implemented to its effectiveness in resolving the conflict. It helps the facilitator to identify the lacking or drawbacks in the procedure and give the opportunity to make improvement and correction. Any late or delay in decision-making or accomplishment of any policy may lead to conflict because employees may not planned to accept any delay. In those situation, where employees does not show any tolerance in stead they become anger and go for association can create serious conflict. Example may be the plan of designing wage or salary structure, facilities in workplace etc when claimed if not fulfilled instantly employees may go for movement, which leads to a conflict between management and employees. If the management is autocratic and do not treat employees favorably in terms of salary, facilities etc these will give rise conflict between management and employees. At the same time if management go for some unfair behavior in transfer, promotion that may also lead to conflict between management and employees. If commitment of employees towards business is not so strong, employees will do not feel themselves as citizens of the organization that can also work as a means of conflict even for a very insignificant reason.  Class difference- A higher class with huge opportunity in the organization and lower class those are deprived from common facilities of the organization. If management is, biased verdict will be given in favor of those who are subservient to management. For this reason some people are deprived from promotion, salary increase etc which instigate the deprived employees to protest and to go movement to fulfill their needs and obligation. All these lead to a conflict between employees and management and sometimes between staff and employees. If the policies of the organization are vogue and create misunderstanding between or among employees, it will lead to a conflict. Because if the expectation of the organization and the recital or achievement of employees do not evaluated accordingly that if management criticizes employees for lower production and employees criticizes the guideline given by the management this tow dimensional estimation leads to a conflict. Any policy recommended by employees for implement some stress remains unimplemented, employees may feel deprived and it can lead to conflict between management and employees. If employees are not sincere about their responsibilities and if the liability of both management situations can increase dishonesty, dishonesty and absolution, which will, ultimately leads to conflict between management and employees. If management and employees are submissive to different political beliefs then such difference can lead to conflict because there ids less possibility that they will reach to settlement in any matter due to different view, beliefs which eventually lead to conflict between management authority and employee groups. Unethical practice like business to some employees for promotion, transfer, salary increment etc may create dissatisfaction in the mind of other employees and sometimes it can lead to conflict between management and employees. Organization needs to take part in some activities in addition to its general activities like building Creech for the children of employees, house and recreation centre for employees, and health and insurance facility to the employees. If not all these activities are done by the organization, these will increase the dissatisfaction among employees, which ultimately lead to conflict. Political instability in the country can also instigate conflict inside the business because of liaison of employees specifically the trade union leaders or employee leaders with the political leaders for their high objective and personal interest. Because political instability helps the leaders to bring outside problem to inside the organization which ultimately leads to a conflict. If the anticipation of the employees is so high and they are, highly ambitious then this can lead to conflict between management and employees in case their stress are not fulfilled. Sometimes political support gives unfair support to the management or to the employee representative for their self-motives. When one party is given support another party does not take it easily, take it as scheme against them, which lead to a conflict. Sometimes government either avoids the importance or arrival of conflict or tries to ignore by slowing any reason, which shows the insincerity of the government. Government does this to remain above denigration and to get praise from different sources. Sometimes situation become so difficult when government cannot play role in resolving such a conflict due to the dependence of government on any of the group involved in conflict or government has no legal power to apply force for resolving disagreement. Sometimes government can take conflict as a usual matter and a very common one. In those situations government take no initiative even after having legal right and power because of their less anxiety regarding the matter.  To remain above criticism. Sometimes government officials takes benefit from the employee representatives or trade unions and stay biased regarding the matter. Ignore any bad consequences of conflict as they are given incentives from the leaders. Social leaders who can resolve conflict may remain silent by taking some settlement from the trade union. Sometimes social leaders support the trade union and take part in the conflict along with the trade union leaders to make the conflict a success in replace of incentives from the trade union. Political leaders may take benefit from T.U or management which works as an obstruction on the way to the conflict resolution procedure. Because political leaders give support to the party which instigates conflict. Such misappropriation by unethical practices in the industry or company. Law of the country may not be effective enough to convict or to punish the accused. Because there are many drawbacks in laws which give the accused a way out to remain free of punishment and to avoid legal action. No applications of law in the country also show the lacking of government in terms of legal action involved in conflict. 17. Lack of training & on conflict management. (8) T.U goes for political liaison for high ambition. (8) Low living standard instigates conflict. Ensure proper facilities of health and safety issue. 9. Increase social involvement of industry. 10. Reduce political pressure on industrial activity.